Rising Cities is a Free to play City Management MMORPG genre game, developed by BigPoint for Internet Browser plataform games. In Rising Cities players get the chance to build and manage their own city, free to play in your own browser this casual management MMO lets you start as a mayor of your own small city where you are responsible for developing a working industry and infrastructure and keeping your citizens appeased. Players are responsible for all aspects of the city development and must balance the wants and desires of the population and balance their economy, resources and energy to create a prosperous and working city. One of the biggest aspects of the game is managing your citizens and their needs, when a player is attracting particular types of residence they must decide whether they wish to focus on increasing their credits by attracting capitalists or production by attracting workers. 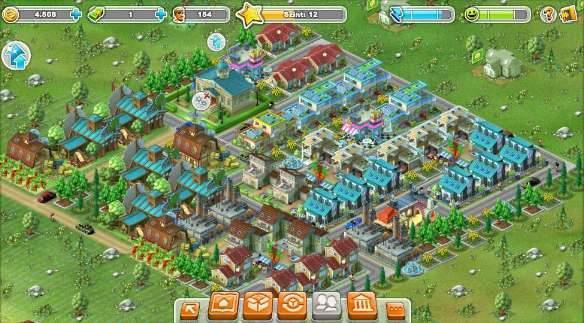 The types of residential building a player can place will determine on specific prerequisites such as nearby buildings, e.g. commercial buildings, before it will produce any income. Once per books are delivered to commercial buildings all residential buildings surrounding it will be granted a special currency, which allows players to collect rental income and is needed to level up. The placement of buildings and other structural elements is vital to creating a working flow for your city, in particular every building has to be connected up to a road to allow construction to begin before any production in the form of goods or income can be yielded. Buildings come in all different forms such as power plants needed to power the city, manufacturing buildings which are used to create materials for construction and products to be sold through commercial buildings, residential holdings for your populous and even decoration that increases the mood of your citizens and take up no further resources once they have been placed. Players can only laydown buildings as allowed by their available building permits, buildings are limited by these permits and so permits must be purchased to place more. Players’ progress is marked very much by the mood of their residents and influenced by their energy sources; the better the mood of the city the easier it is to attract new residents, which will in turn grant even more income to further expand your city. The populous will have certain demands that the mayor needs to meet, such as various commercial buildings, which in turn require power plants and manufacturing buildings that contribute to a negative mood and so the mayor must continuously juggle and balance out these needs.